Today’s step is going to take a bit of a detour. One of the things that kills you when rebuilding a box is that you have to download dependencies every time from the internet. With big files this can be quite slow, and can keep you from working at all if you are offline. So I’m going try and cache as many of these files on my host box as possible so this isn’t an issue. Of course if I add new dependencies and I’m offline, it won’t work unless I’ve somehow cached them before. But I should be able to rebuild the machine. So if you pull down the repo, there will be a tag for Day 2. * In the Dockerfile, tell docker to copy the 30proxy file over to /etc/apt/apt.conf.d/30proxy, so that it’ll configure apt. * Create a hostconfig.sh script which you can (and should) run to install squid-deb-proxy to your host and correctly configure the container to point at the host for it’s apt cache. * Add a shell.sh script which makes it easier to shell into this instance. So we can see this is working by opening a second terminal window and doing a “tail -f /var/log/squid-deb-proxy/access.log”. Which means squid served the file from memory (no external network access). TL;DR: Over this series of articles I’m going to try and build up and develop for node.js in a re-usable continer (vm) without polluting my host machine with various versions of node.js, mongodb, etc. For a while I’ve been using vagrant and chef/puppet to develop in sandboxed environments without pulling dependency hell onto my host computer. In fact my host computers (laptop and desktop) are now pretty vanilla linux mint systems with editors and git installed. I actually version what I have on these boxes using puppet. However, I have a few problems with vagrant for development. I don’t know if docker will solve these but we’ll see. Host/Guest shared filesystems have lots of permissions issues on linux and even more on windows. The differences between usernames and root/non-root cause real issues when developing code on your host but building / generating on a VM. Guest VM’s use up ram. This isn’t an issue on desktops now a days with > 24gb ram easily accessible. But it’s a big deal on laptops which are still averaging 8gb. Not easy to checkpoint VMs or rebuild from a midway point. I may be missing something here with vagrant, but it’d be nice to have a good known base and restart from there. Have to be online to get updates or build your box. That said, I really like the reproduceable system/machine configurations that vagrant and chef/puppet allow you to have. I also really like being able to just checkout out a project and “vagrant up”, and have a sandboxed environment ready to go (with some caveats). You should install the latest docker. Follow the instructions on the site. I’m not going to update this to keep in sync with docker (which is moving quickly). Coming from vagrant I expected some form of smart configuration file. Docker doesn’t really do that. I was also expecting redo-ability, like you get with puppet or chef. You don’t get that either. What you do get is a very simple command by command syntax which executes line by line. It’ll execute everything in the file every single time the build is run. So hopefully you’re a bashmaster. This says start with the ubuntu:12.10 base image. This comes from the base docker boxes. For those familiar with vagrant, this is like vagrantbox.es. This runs “apt-get update” as root. In fact everything in the Dockerfile is run as root. Now we need to build this machine. You can clone this repository from https://github.com/gaffo/docker_nodebase, or you can just save the Dockerfile into a new directory. docker build -t u1210_node . In the directory containing the dockerfile. This will build a new container and if it succededs, it will tag it as u1210_node (so that we can use it later with a “from” directive).
. is actually the path to the directory containing the Dockerfile, so you could run this from anywhere. And containers are referenced by ID/tag not by path so context doesn’t matter at the moment. This will change when we try to share files with the container. This will launch an interactive terminal (-i) allocating a pseudo tty (-t) with bash as the program (/bin/bash) into the container with the tag u1210_node. Try it. You can play around all you want. Next time I’m going to try and work up a Dockerfile iteratively with all the cruft I need to do app development with node. This little beauty will append CR: REVIEWER to all of the commits from the master to the current head (all of the local commits). 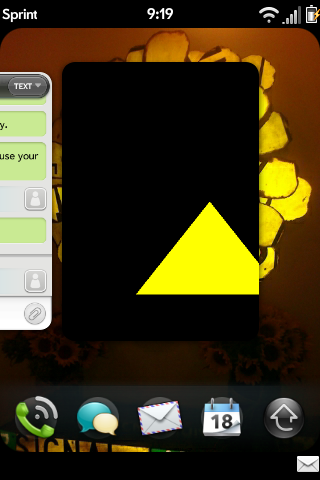 I just wanted to share what it took to draw a simple yellow triangle on a black background in OpenGL|ES. I hope it will give my Ruby friends and Haskell friends an aneurysm. const char* vShaderStr = "attribute vec4 vPosition;    \n"
"   gl_Position = vPosition;  \n"
const char* fShaderStr = "precision mediump float;\n"
"  gl_FragColor = vec4 ( 1.0, 1.0, 0.0, 1.0 );\n"
So I thought it was funny that many of my friends have been going to more and more abstract languages, while I, oddly, have decided to go lower. I have been playing around with doing OpenGL|ES and C++ lately in my spare time, hopefully in prep of the release of the Native SDK (PDK) for the Palm Pre. Recently I have been using cuke4duke on a java project (which I’ll discuss in a later article). We have jruby running from jruby-lib/jruby-complete.jar. Our gems are embedded in the project with the GEM_HOME/GEM_PATH being set to jruby-lib/gems. All of this is under source control. We don’t have jruby installed at all on the system, it is only in this project. I’ve mainly been the one on the team (of 4 total) who has been maintaining the jruby stuff as none of the other devs have jruby experience. So one of the problems I had recently was how to update the gems that are checked into source. One of the other devs wanted to use multi-line strings in cucumber and found that it didn’t work with cuke4duke until cucumber-0.4.4. We had 0.4.2. So what I needed was an easy way for the other devs to be able to update the gems without relying on jruby being “installed” on the machine. Since these are java guys, ant seemed the best solution. Pivotal is also hard at work at Pockets (not yet released) which provides on emulator testing and integration of Jasmine into your WebOS application. However, as of now (2009/09/21), this has not been released owing to major changes in the debuging environment in the WebOS SDK. jasmine_webos -s. You can then run your tests by hitting http://localhost:8888 with any capable browser. * including mojo framework libraries for fuller stack testing. Please report any bugs to the github bugs page. can use fixtures, factories, or whatever. Basically you can now test selenium in your same transaction and don’t have to worry about rolling back your fixtures or factories. Recently I added a configuration mechanism to Webrat. It was surprisingly easy, and mainly copied from rails core. I would suggest adding somthing like this to any plugin that has more than a few features or ones that users have asked to have turned off. First off you’re going to have to create the actual configuration object. There are a few good ways to do this. One is to use a config module, another is to create a configuration object that is accessible via a singleton method. I’m going to go with the second one, a configuration object. # Should whiny error messages be shown? Okay, now we need to test the config object itself. This is why it’s nice to make an object just to house the config, it’s easy to test. What do we test? Well defaults and accessors for two! Now we need to do some stuff to make it nicer for our other users to test. Put the following in your test_helper or spec helper. It will allow you to clear your config after each test. Nice to have to to avoid messy test issues. This last bit is somewhat hard to do in test::unit as it is harder to hook into the setup (you only get one in the call chain). I’m willing to take some help on cleaning this one up for test::unit. Currently I have just been putting it in the setup / teardown for each test file. log(&quot;you should really fix this&quot;) if Plugin.configuration.show_whiny_errors?